Prominent & Leading Manufacturer from Surat, we offer silk saree, fancy silk saree and printed sarees. We are suppliers of high quality Silk Saree Fancy. 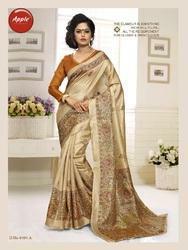 We are providing Silk Saree Fancy Bhagalpuri Silk.